For packaging hand-carry bowl for noddle, ice, rice, soup and hot drink, etc. * Fully automatic operations. 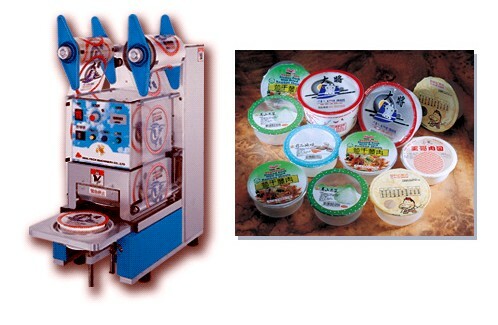 Once the bowl is loaded, it is fed into the machine for sealing operation, and outfeed automatically after sealing. * Compact construction, minimum space occupid, and very easy to operate. * Full stainless steel construction meets sanitation requirements. * Equipped with safety device.